Itemis-glen-1888 - Aerial view showing downtown city centre, Calgary, Alberta. Itemis-glen-1889 - Aerial view of Macleod Trail at Southland Drive SW, Calgary, Alberta. Itemis-glen-1890 - Aerial view of Northland Village Mall and surrounding area, Calgary, Alberta. Itemis-glen-1891 - Aerial view of Northland Village Mall and surrounding area, Calgary, Alberta. Itemis-glen-1892 - Aerial view of Race City Speedway in southeast Calgary, Alberta. Itemis-glen-1893 - Aerial view of Macleod Trail, Calgary, Alberta. Itemis-glen-1894 - Aerial view of King Hussein of Jordan's aircraft at Executive Flight Centre, Calgary, Alberta. Itemis-glen-1895 - Aerial view of Stampede grounds looking towards downtown city centre, Calgary, Alberta. Itemis-glen-1896 - Aerial view of Calgary Zoo on St. George's Island, Calgary, Alberta. 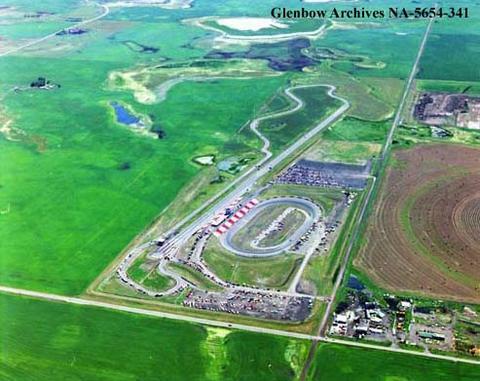 Item is-glen-1892 - Aerial view of Race City Speedway in southeast Calgary, Alberta. Aerial view of Race City Speedway in southeast Calgary, Alberta.